This page created on 2nd September 1998, updated 23rd January 2011. The success of the coach prototype, CRL4, combined with growth in GreenLine travel, produced an inevitable result. London Transport, after so many times building double-decker coach prototypes, now built a whole class of them. 68 of them. 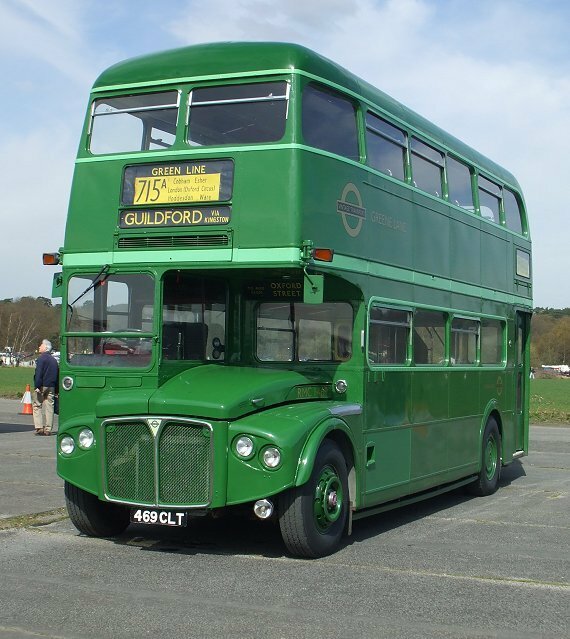 They were modified standard routemasters, 27ft 8in long, 8ft wide, with an enclosed rear platform and electric doors. This also meant having a downstairs emergency exit, which was built into the rear of the platform, like CRL4. Unlike the prototype, the exterior door handle was at a low level. Fluorescent lighting, a touch of sheer modernity for the "quality" customers, was installed. The air suspension applied to a few of the early standard RMs was applied to the whole class. The same 9.8 litre AEC AV590 engine was used, but with a different gear ratio to permit higher speeds. The gearbox was semi-automatic rather than fully automatic, to reflect the smaller number of gear changes on GreenLine work. All this, plus deeper upholstery and more widely spaced seating, was designed to give a more comfortable ride. One reversion from the prototype was the return to bench seats over the rear wheel arches, in place of the diagonal bucket seats on CRL4. This all pushed the licensed weight up by a half-ton, to 7tons 15 cwt., although they seated only 57 (32/25). The exterior finish was excellent too. 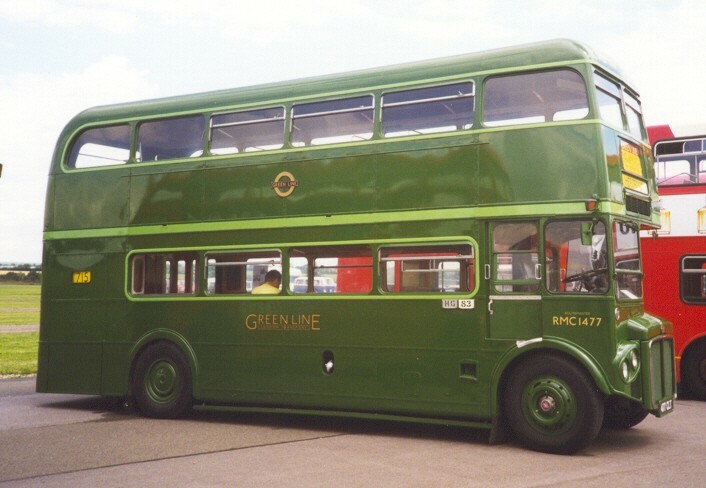 The original scheme tried on CRL4 was used: Lincoln green, with pale green trims around the windows and a matching cant-rail band. There were small GreenLine roundel plaques on the tween-decks panels, and a small roundel transfer above the centrally placed rear number-plate. Another touch of distinction was added by adopting the current fashion for twin headlights. 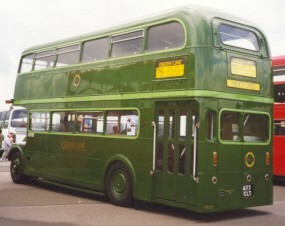 The RMCs went into service just after the trolleybus conversions finished, while red RMs were being stored during the dispute over RT replacement. Twenty (RMC1453-1472) were allocated for the 715/715A between Hertford and Guildford/Marble Arch. 12 went to Hertford garage (HG) and 8 to Guildford (GF), ready for 29th August 1962. Another two were added to the allocation during September, and RMC4 (the retitled CRL4) was added to the Hertford allocation in October. 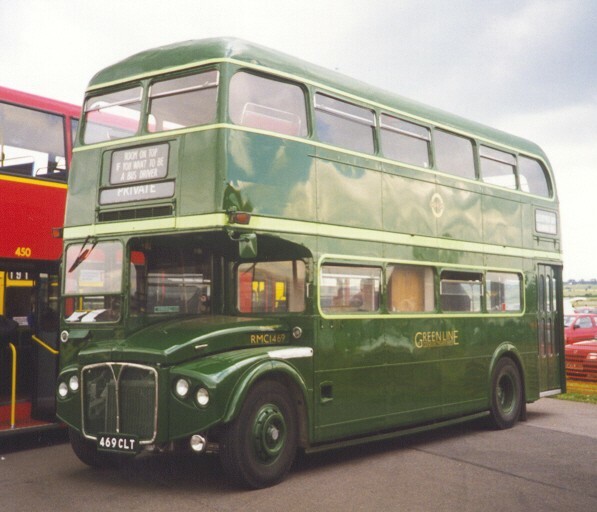 RMC1477 (left) was originally allocated to Guildford in September 1962, for the 715. Now in preservation, it shows the early form of radiator grille, bonnet badge and ventilator grille above the cab. (Showbus, 1997). RMC1469, (below), also preserved, shows the later form of each, and also the later lack of external platform handrails. (North Weald, 1998). Epping (EP) was the next major receiver of the type, for the 718 (Harlow-Windsor), 720/A (Bishops Stortford / Harlow -Aldgate). Windsor (WR) also received a share for the 718. Some of these were transferred in from HG, which received new ones in exchange. Garston (GR), the Watford garage, received eight (RMC1499-1506) in November 1962 for the 719 (Hemel Hempstead - Victoria). The 716/A (Chertsey / Woking - Hitchin / Stevenage) was the last of the original allocations, with eight RMCs to Stevenage (SV) and nine to Addlestone (WY), again a mixture of new and used vehicles. RMC4 was returned to Stevenage, and stayed until swapped with Epping for another RMC in February 63. These initial coach allocations also involved filling-in turns on local bus routes, a long-established practice. The allocation at Epping was transferred to the new garage at Harlow (HA) when that opened in May 1983. Consequently the 393A ceased to be served by RMC short workings, but Harlow routes 397 and 804 benefitted. The new buses settled down in service. They did have teething problems, different from the town RMs. In particular the air suspension was unreliable at first, and the less frequent braking meant that a different policy about dust guards had to be adopted. Pitching when running fast was also a problem, requiring suspension stiffening. A retrograde step in appearance was the adoption of advertisements on the rear panel, from 1963, a distinct break with GreenLine tradition. In May 1964 RMC1469 was taken out of service to act as a guinea-pig for the appearance of the forth-coming RCLs. It received new front blind apertures, with both panels the full 3ft 6in wide. The raised bullseyes on the sides disappeared, as did the fleetnames from the lower panels. Instead there were large bullseye transfers at the front of the upper panels, with Green Line block-lettered behind it. A smaller bullseye and fleetname appeared on the offside staircase panel. More significant perhaps were the new deeper front wing panels, with no cut-outs for ventilator grilles or the spotlight. These eventually became the RM standard. RMC1469 also received the new style radiator grille with triangular badge. Another change that quickly became the norm in both red and green fleets was the casing over of the bottom half of the heater grille, with the painted band continued over it. Although RMC1469 lost its amended body at subsequent overall, in preservation it has been restored to its condition with RCL-style wide front blind-box, side transfers, deeper wings without louvres, and no external door hand-rails. 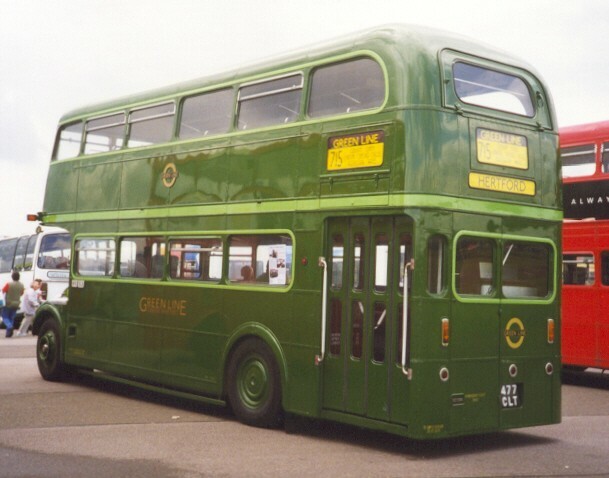 Here it is at the Cobham Bus Gathering to celebrate 80 years of Green Line, in April 2010. As the sixties progressed the GreenLine network suffered. A buoyant growth area for LT after the war, it competed badly against the rise of the motor car, both in direct abstraction of its target clientele and in terms of service slowing through traffic congestion. Electrification of the Eastern Region suburban services also affected the north-east services particularly badly. By November 1964 the traffic on the 720/A could no longer support the double-deckers, and these services reverted to RF operation. 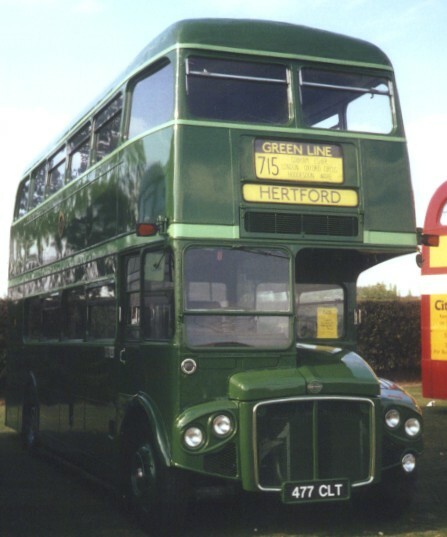 Four of the RMCs went to Hatfield (HF), and four to Swanley (SJ) for use on the extended 717 (Wrotham - Welwyn Garden City), on which the new leg from Victoria to Wrotham replaced that lost on the withdrawn 703. The advent of the RCLs should not have affected the RMCs, but the best-laid plans of mice and men gang aft aglay: The RCLs proved not to be allowable on the 723B, so some of the Grays allocation went instead to Hertford for the 715A, whilst five RMCs went to Grays. The external handrails were removed from the RMCs during 1966, replaced by handrails on the inside of the doors. Overhauls during 1967 produced a simplified livery, with no window lining, and with large transfer roundels replacing the small raised ones. It was not an improvement. The overhaul round also shuffled the bodies, so that the odd one from RMC1469 reappeared on RMC1502. Further GreenLine reductions in December 1967 saw the loss of the northern end of the 717 (HF) and the switch of the 716A from Stevenage to Hatfield. RMCs from Stevenage replaced RCLs on the 723 group at Grays. The remnant of the 717 (SJ) and the 719 (GR) lost their RMCs (replaced by RFs), which went to East Grinstead(EG) and Two Waters (HH) for the 708 (East Grinstead to Hemel Hempstead). One RMC also became the London spare in December 1967, garaged at Riverside(R). 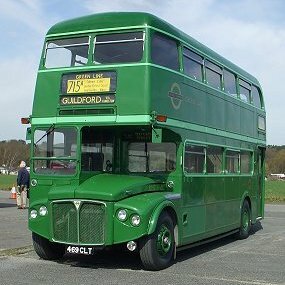 Two other RMCs became official spares for RCL routes, at Romford and Dunton Green. A more serious decline in the class' fortunes occurred a year later, when the 708 went back to RF operation. There was no obvious GreenLine work for the redundant RMCs, so they moved onto bus operations. At Hatfield they replaced RTs on the long 303/A plus more local Hatfield routes. A pair went to Addlestone until the following May to work on the 461A, and then went to join others on the 370 route from Grays. In October 1969 RCLs were displaced from the 704 and went to Grays for the 723 group (again), releasing six more RMCs which were then officially allocated to bus work from Grays. Part Two: London Country Photographic references Fleet History.